Uber engaged the services of Facilitate Corporation to provide design and project management services to fit-out new office space nationally. Offices included Queensland, Melbourne, Sydney, and Perth. From 2014-2016 Facilitate provided a design and build service to build the Australian offices that ranged from 300-1000sqm. All projects were built under a rapid, fast track program, the jobs were often being designed as they were being built, in order to meet the short deadlines. 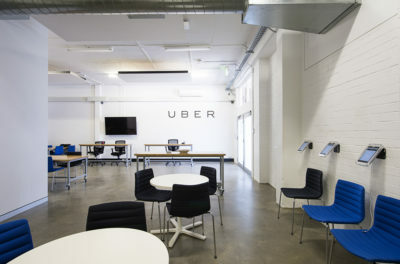 Uber requested that technology be at the forefront of the design, in addition to having clean open spaces for collaboration. We incorporated the use of acoustically private meeting space for confidential meetings with legal teams or the Department of transport. The client provided feedback that they were impressed that the private meeting areas were completely sound proof. Uber also provided feedback that the kitchen area and staff hub has increased their team’s engagement, morale, and spirit. 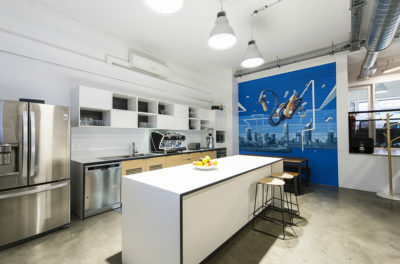 Facilitate incorporate Uber’s values into the design which included, creating a positive difference to clients and the idea of transport, we did this by making an installation of the Uber bikes on the wall when you walk into the space. 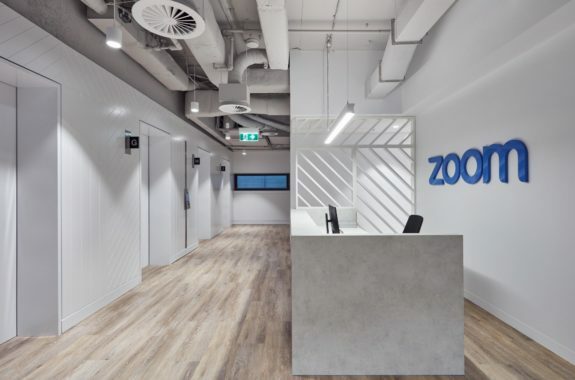 Utilisation of exposed ceilings and floors brought the aesthetic to a ‘no holds barred’ approach. Peeling back the building elements so its raw and industrial and allowing the staff to be the shining stars in the space. 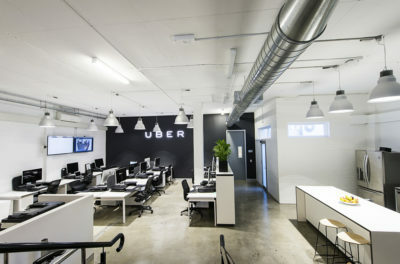 Facilitate delivered the offices in extremely quick timeframes to meet Uber’s needs. The Perth office was built in 12 weeks in total, Brisbane was built in 6 and Melbourne was built in 16 weeks. Facilitate engaged in weekly calls with the Singapore office to manage each of the state projects. Facilitate’s honesty and hard work to get us into our spaces on time was beyond expectations. We have no hesitation recommending Facilitate to anyone in the market for commercial design, project and construction management services. 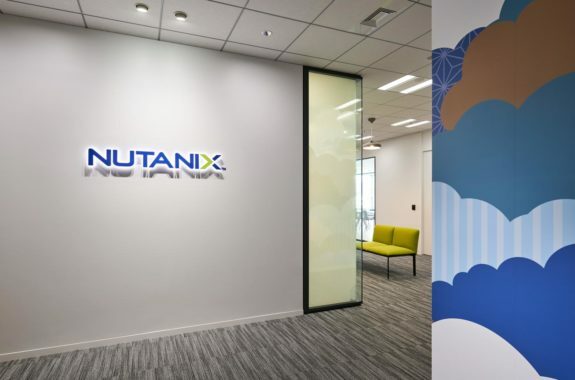 I would like to offer my sincerest thanks for the outstanding service and results that you have delivered during the design build of our office fit-outs nationwide. 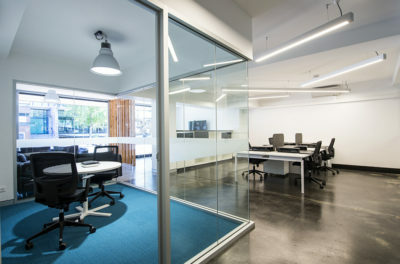 Our team is extremely dynamic so it was important to us that the design incorporated cutting edge technology; clean, open spaces for collaboration; individual staff hubs; plus an allowance for private spaces to host confidential meetings. Not only were all these requirements met, but the non-standard requests such as specific AV features and lecture style seating for the driver training facilities were outstanding. Overall, I was thoroughly impressed that your designers were able to satisfy such diverse requirements while creating a work environment that is as enjoyable as it is functional. You delivered the offices to meet our extremely short timeframes; and kept us well informed of progress via the regional HQ in Singapore, and local representatives in each of the 4 capital cities. The quick turnaround time allowed our team to move in quickly and hit the ground running. We value how the Facilitate team harnessed different elements of each capital city into the space design (e.g. the commissioning of local art pieces which captured energy, innovation, and transport) while incorporating Uber’s values of creating a positive difference to our clients. We have a lot of people come in and say how amazing our offices are. The design certainly fits the ‘Uber’ brand.